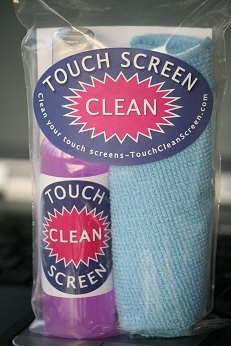 Touch Screen Clean is specifically formulated to clean and enhance the feel of your touch screen. Touch Screen Clean is safe and effective to use on your touch screens and screen protectors. Other cleaners with alcohol or ammonia will scratch and dull your screen. The screen manufacturers recommend using distilled water, but that is just not effective. Touch Screen Clean's 100% synthetic polymer-resin based formula combined with acrylic wetting agents gives your touch screen a clear and bright look and a smooth touch. The anti-static ingredients will reduce the static charge that attracts dust while also removing fingerprints and smudges. Touch Screen Clean eases tiny scratches with an ultra-clear and bright micro-thin polymer layer. The special Microfiber cloth lifts dirt and smudges without scratching your touch screen. You can take the Touch Screen Clean kit with you on an airplane because the clear 2oz bottle and clear zip-storage bag are allowed for air travel. Touch Screen Clean also works great to clean your glasses and other glass and plastic parts of your touch screen devices. Touch Screen Clean is also great for laptops and flat screen televisions.